Myles Powell racing to the other end after a steal. Photo by Jason Schott. Seton Hall was outlasted by DePaul, 97-93, on Saturday night at Prudential Center for their third consecutive loss. They are now 3-4 in Big East Conference play and 12-7 overall. This was DePaul's second win over Seton Hall in two weeks, having beaten them 75-74, on January 6 in Chicago, and it was their second straight win on a Saturday night in the New York metro area, as they won at St. John's on January 12, 79-71. DePaul improved to 3-3 in Big East play (11-6 overall) and they were led by Max Strus and Femi Olujobi, who each had 22 points. Strus shot 7-13 from the the field, including 4-6 on three-pointers, with 6 rebounds and 2 assists. Olujobi shot 6-10 overall, and he also had 11 rebounds to give him a double-double. Paul Reed had 21 points, 15 of which came in the second half, on 8-14 from the field, with 14 rebounds for a double-double. Eli Cain had 13 points (4-6 FG, 1-2 threes), 3 assists, and a rebound. Seton Hall was led by Quincy McKnight, who had 25 points on a superb 9-for-11 from the field, including 2-3 from behind the arc, and just missed a double-double with 9 assists, plus a rebound. Miles Powell had 24 points (7-16 FG, 4-9 threes), 6 assists, and 2 rebounds. Myles Cale had 19 points on 7-11 from the field and a superb 5-7 on threes, with a rebound. Sandro Mamukelashvili had a double-double with 12 points (4-8 FG, 2-3 threes) and 10 rebounds. This was a shootout from the start, with Seton Hall holding a 49-48 lead at halftime. Seton Hall shot 56.7 percent (17-30) from the field in the opening frame, while DePaul was 16-31 (51.6 percent) from the field. In the second half, DePaul opened up a five-point lead, 60-55, on a Strus three-pointer at the 14:41 mark. Seton Hall battled back and took a 65-64 lead on a McKnight three at the 9:38 mark. Strus responded with five straight points (two layups and a free throw), followed by a Reed jumped that made it 73-67. They maintained a five-point edge until Mamukelashvili drained a three with 2:28 left that made it 87-84 DePaul. A minute later, Reed made a jumper to give them a 91-86 lead, and two free throws from Mamukelashvili made it a three-point game with 1:03 left. Olujobi sealed the win when he buried a baseline jumper with 31 seconds left to make it 95-90, and then on Seton Hall's ensuing possession, blocked Powell with 22.6 seconds left. 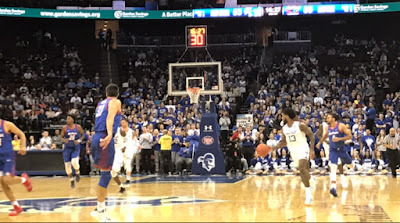 Seton Hall took a timeout, and a Powell three-point attempt was blocked by Reed, and McKnight fouled Devin Gage with 18 seconds left, and he buried a pair of free throws. Powell buried a three as time expired to make the final 97-93 DePaul. 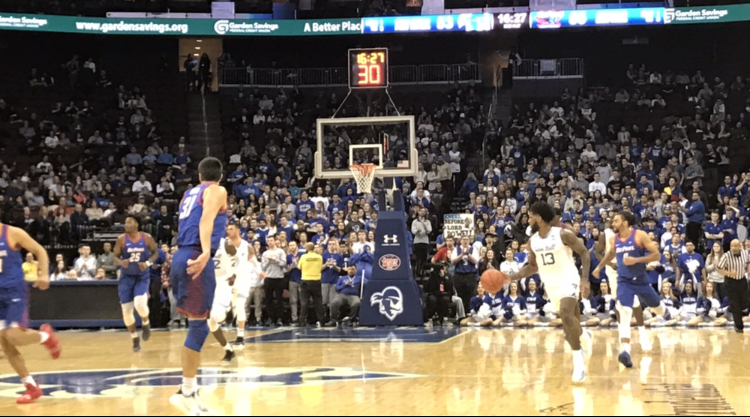 Seton Hall Head Coach Kevin Willard said of allowing a season-high 97 points, "Obviously in the second half, their inside game really dominated, but I thought we had some breakdowns in the first half that really hurt us. I thought we were doing a good job on (Max) Strus, and we let him get loose early a little bit late in the first half, and that really kind of gave them momentum. We just couldn't get a stop or a rebound in the second half." Seton Hall freshman forward Darnell Brodie got his first start of the season after some strong performances off the bench. He played 13 minutes, but was not a factor as he had no points, missing two field goals, no assists, or no rebounds. "To be honest with you, I knew going in that Femi (Olujobi) has been killing everybody. He's been putting a hurting on everybody, and we're trying to save Sandro for as many minutes as possible of being down there and banging him, and I think it started off okay, but it didn't end up all that great." On his message to the team after giving up 97 points, Willard said, "We'd been playing pretty good defense, to be honest with you. Our numbers are pretty good. We've just got to use this week to kind of get back to being solid. We've got into some bad habits without practice -- we're gambling too much, we're reaching too much, and we've just got to get back to getting solid. I think this week will be good for us to kind of get back into a good rhythm defensively. But they've been working, they're out there working hard. We've just got to be a little bit more solid." "Hopefully the older guys -- Mike and Myles Powell -- they've been through this before a little bit, and we're only seven games into conference play, so it's not like we're 17. We've still got a lot of time. I think we definitely need to recharge emotionally to kind of get back to playing emotionally at a little bit higher level, but again, I think this week will really give us a chance to do that." Willard said of McKnight and Cale's productivity helping Seton Hall moving forward, "I thought -- even in the Providence game -- I thought Q was really picking the right spots. He just missed some shots in the Providence game, but I just think he's being aggressive at the right times. He also had nine assists and two turnovers, so for Q's game, I think he's starting to really find his groove offensively. And Myles Cale, I think he got on the break tonight, he got some easy stuff. He's been working hard on his shooting, and it's good to see that that's paying off. I like where Q is, and I know Myles Cale is going to continue playing well." Seton Hall is off until next weekend when they hit the road for a matchup with defending national champion Villanova on Sunday, January 27 at 2:30 p.m.